On the precipice of huge disruption by automation technologies, there is a pressing need to relook at the role of humans in the workplace, and the role of ‘work’ in society. an epidemic of illness (including depression and anxiety) which can be traced to root causes of deep social isolation and disconnection from meaningful contribution in the world. ‘Mass customization’ of jobs, giving more people the opportunity to work on what is most meaningful to them. Harmony between work and personal life — integrating personal values, flexibility and belonging. “When it comes to changing the values, mindsets, rules and goals of a system, story is foundational. Deconstructing what it means to be ‘professional’ to embrace what science tells us makes humans most effective, creative and intelligent together. Recognising the necessity of incorporating higher levels of emotional and intuitive intelligence into our workplaces. Learning to coexist peacefully with others amongst difference and complexity. ‘Automation for good’ programming intelligent technologies with cultural principles of greater inclusion, equality and fairness. Increasing the amount of human (and machine) energy going in to solving Canada’s wicked problems. Creating new safety-nets for economic security and protections against ‘the torment of joblessness’. Chloe has spent the past six years on the design challenge of creating the organization form that's equipped to solve the world's most wicked problems. From Enspiral in New Zealand, to IO Collective in Europe, to Percolab in Montreal, she's been a leading part of the world's most innovative experiments in the future of work. Her conclusion? The most impactful organizations are those that give focus to creating a human-centred culture; developing people into new levels of empathy, cooperation and co-creativity. After participating in Reframe Work (Vancouver Feb 2018), she's now taking these learnings to catalyze The Future of Work is Human in Canada. Marie-Andrée holds a M.A. in Musicology and is currently completing an M.Sc. in Administration at HEC Montréal. With seven years experience in the corporate work, she has experience as a facilitator, management consultant, teacher and creative project lead. What is born of this diverse experience? She holds a multidisciplinary and human-centred approach to problem solving and innovation, leading by questioning the accepted paradigms. What is the role of humans in the workplace and in the world in the 21st Century? How do we redefine the concept of value? How can each individual deliberately create their own unique career and life path? 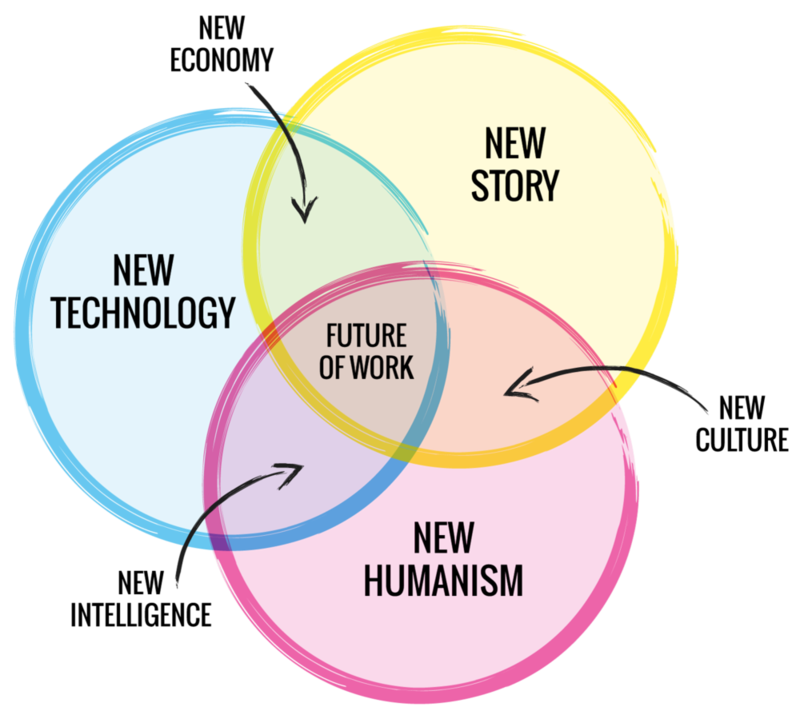 This is the new story that Marie-Andrée wants to write with The Future of Work is Human. Ludovic is a certified Neuro-Linguistic Programming (NLP) coach with a background in software development. His strong passion for the principle of interconnectedness has taken him on an adventurous path from lecturing at the University of Sherbrooke, to seeking enlightenment to India and bringing collective and emotional intelligence to the workplace through Agile methodologies and principles. Today he puts all these learnings in the service of professionals and organizations so that people can craft an energizing and meaningful work experience together. An experience of growth, purpose, achievement and belonging. Your awesome bio saying why you're joining this initiative. Which projects would you like to join?